My mother used to make this very often when we were young, and I JUST noticed a similar version of this on the box of Nabisco Famous Chocolate wafers. On the box, it’s in the form of a log cake. That must be where Mom got her inspiration. Hers were individual little stacks. I have to say, I think I like her way better. It’s more individual, and to me, prettier. It is EXTREMELY easy, versatile, and even fun for the kids to make, yet, it can look very elegant when “dressed up”. You can flavor the whipped cream any way you like. Simply add a teaspoon or so of pure vanilla, or kick it up a bit with Kahlua, Amaretto, and get that fabulous chocolate/orange flavor if you add an orange liquor. The Hazelnut flavor of Frangelico is great too. 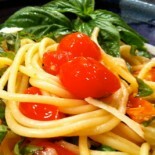 Of course, you’d adjust your toppings to compliment the flavoring you use. For example, chocolate covered or roasted coffee beans are fabulous grated and added to the whipped cream, and use a whole bean to top it if you use Kahlua. Amaretto flavoring is nice to include either the salted roasted almond, or candied. (Sweet and salty, ooooh, great combo.) Hazelnuts, with Frangelico, and if you use the orange liquor, candied orange rind, or a mandarin wedge. Yum. Use your imagination and your favorite flavors. You can’t go wrong with this beautiful, tasty, little dessert. The hardest part of this recipe is finding a store that carries the Nabisco Famous Chocolate Wafers. 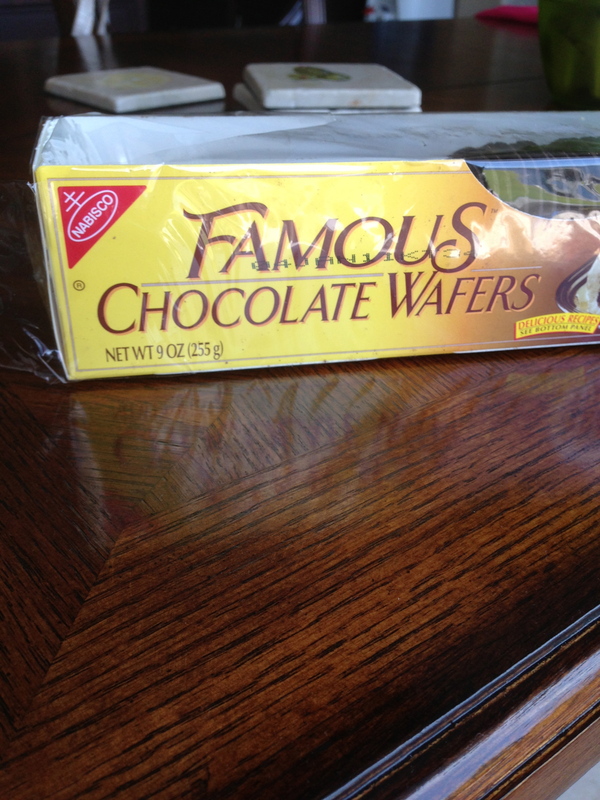 Nabisco Famous Chocolate Wafers- hard to find, but worth it! You can either make your own whipped cream, or use a ready-made whipped cream, or even Cool Whip. Add an optional flavoring of your choice, about 2-4 t for about 8 oz of whipped cream. Blend well. Set aside. Prepare the toppings. Either grate or chop nuts, coffee beans, whatever your choice, but leave some whole for the garnish, and a few to place on the plate around the stack. A cherry on top is also beautiful with a small mint leaf, or a pretty little pansy. Pansies are edible, and add both beauty and flavor. With a kitchen teaspoon, place a small dollop of whipped cream on the wafer. Sprinkle a dusting of topping, place another wafer on top, pressing slightly. Repeat with more cream, topping, wafer, until the 4th wafer is on the top. Add a small dollop of cream, a wisp of topping, then a whole piece of topping, be it a whole nut, coffee bean etc. This is one serving. Repeat constructing stacks until all ingredients are used. Lightly cover tray of desserts with a sheet plastic wrap, and “cook” in refrigerator for approximately 4 hours or longer, overnight is even ok. Be careful not to crush the top. The moisture from the whipped cream softens the wafers and makes them into a cake like consistency. Another bonus of shopping among several agents and/or bro�kers is the increased exposure QuotesChimp will have to the many com�panies in the market. Remember, when you speak to five independent agents or brokers about insurance, you may be com�paring 50 different insurance companies! Finally, don’t forget to compare the products of the independents and brokers with those of exclusive agents. By taking a week or so to allow the insurance professionals to do their thing, you will have given yourself a solid grasp of what is available on the market and at what prices. How did I not notice Allen doesn’t like clcoohate? Hmm I was planning a clcoohate dessert for French Supper Club. I think I’ll keep Allen’s for myself you’ll miss your double dessert that night. Nice post – and Frangelico is definitely a good idea! Thanks! I hope you give it a go and let me know how you like it. Happy Memorial Day. 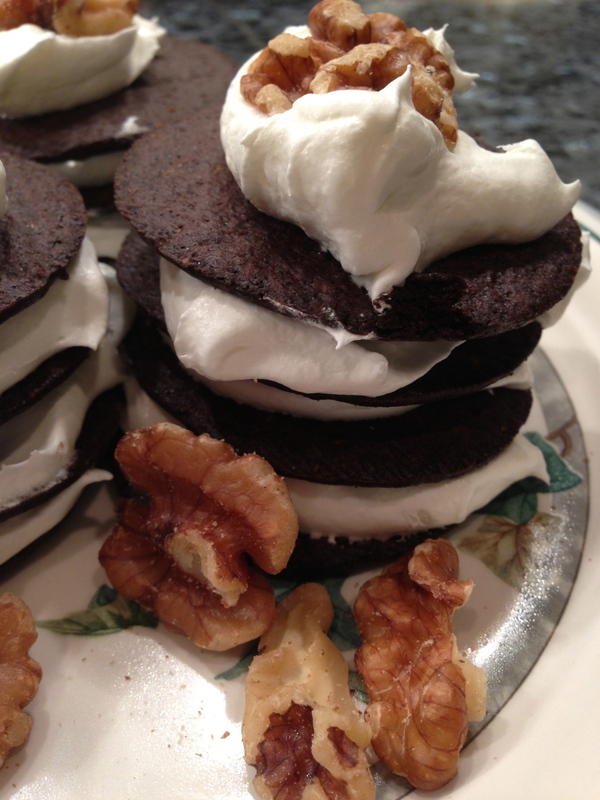 This entry was posted on May 27, 2013 by barbaralandfair in dessert, Uncategorized and tagged chocolate, coffee beans, cool whip, dessert, easy, elegant, fast, liquors, Nabisco Famous Chocolate Wafer, nuts, refrigerator, whipped cream.